How to Learn Vocabulary – 7 Polyglot Tips! Memorizing new words and expanding your vocabulary is an essential part of language learning. Learning a new language requires a lot of work, dedication, time and effort. Whether you’re going to succeed or not depends largely on our ability to learn new words. The good news is that there are simple, yet effective ways to improve the way you learn new vocabulary and boost your language learning. 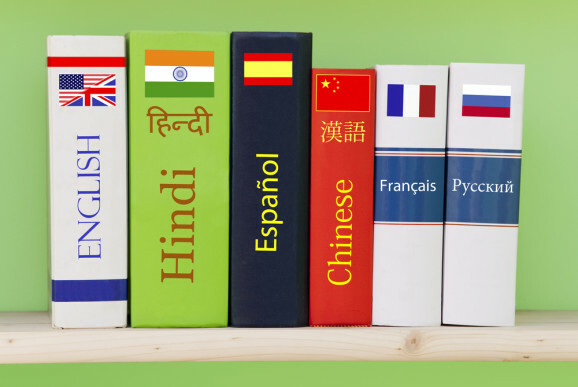 In this post, I’ll show you a few effective tricks used by polyglots which could help you improve your memory, and you could become better at learning new vocabulary. This blog post was originally published as a video, watch the original video here. #1 First input, then output! The first tip is very simple – you first need input, before you can produce any output. Learning new vocabulary can be frustrating. We often tend to look at new words only a few times, expecting to memorize them immediately. Later, when we test ourselves on how well we remember them, we usually find that, in reality, we recall less than we thought we were able to. Keep in mind that you need to see a word many times (input) to really remember it. When I was learning Russian, it sometimes required me to look at a particular word more than 8 times in order to finally memorize it. For German, a language which is quite similar to my native language – Dutch, I can often memorize new word by only seeing it one or two times. The amount of input you need depends on how different the language is from the languages that you already speak, but in general, you need to be patient and accept the fact that you’re most likely to forget it the first time. It’s OK to test yourself at an early stage, but don’t get discouraged when you can’t recall new words. It’s normal. Your brain needs to see a word many times until it is considered to be ‘’important’’ after which it saves it in your long-term memory. Humans tend to remember words better when they’re in context. For that reason, reading can be an effective way of learning new vocabulary. Sometimes it’s easier to remember a whole phrase, than a specific word separately. For example, if you’re trying to learn the word for “table”, it might be easier to learn a whole sentence, such as: ‘’John is dancing on the table’’. Imagine John dancing on a table. This is a picture that you can actually visualize and remember. It’s easier to associate a new word to a picture than just the translation. Learning in context can mean that you learn new words, in a sentence, a story, a real life situation, a song, a podcast, it doesn’t really matter what your source is as long as there is a context. Learning in context is the key! When learning a new language, try using different learning materials. Don’t get all of your information from just one source. Learning is about making associations. The more number of situations and context a word appears in, the more associations you can make with it. This way it is more likely that you will be to memorize something. When a certain word keeps showing up, not just in your textbook, but also in the songs and podcasts you listen to, that word must be important for some reason. Your brain will notice this and eventually store it in its memory. It is a very useful trick and it has helped me a lot, so give it a try. Recent research shows that you’re more likely to memorize new information when you study in different places. This New York Times article on learning and studying habits shows that changing studying locations, as well as the type of material you’re studying with, will help you retain the information better. So, learn at home, while you’re traveling, at the office and during a coffee break. Give it a try and let us know if you think it helps! All of us have spent hours learning stuff at school that we can barely recall today. The reason we no longer remember it is that so much time has passed since the last time we studied or used it. The same thing happens in language learning. So how can we forget less in the long term? Well, there is something called: spaced repetition systems (SRS). Spaced repetition means you revise your vocabulary (or whatever you are learning) using certain time intervals. The better you recall the information studied, the longer the time intervals become. 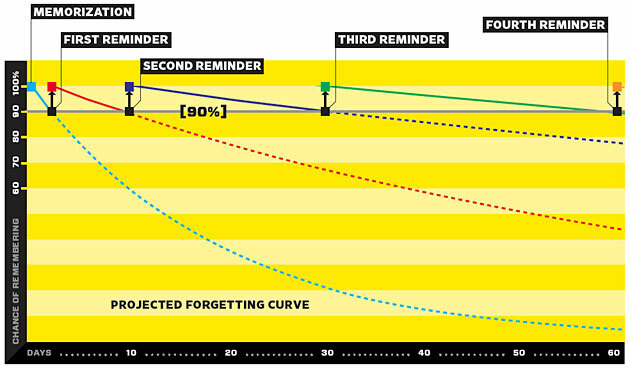 This way, the method lets you revise what you’ve learned, just when you’re about to forget it. There are many online tools and apps that can help you with this. Anki is probably the most famous one. Some other apps you could check out are Memrise, Readlang, Tinycards, and Vocabulary.com. While using flashcard apps that make use of SRS such as Anki can be a bit boring, we find it is a highly effective way to study, especially at the beginning of the learning process! We’re a big fan of using apps like Anki, that make use of spaced repetition. One of the most effective ways to learn new vocabulary is by connecting new words to the ones you already know, in any language. For example, I’m trying to remember the word for a bridge in Russian – most (МОСТ). I can make a connection to that word in Dutch, which sounds similar – mast. When trying to make connections, listen carefully to the sound of the words. Does it sound like a word that you already know? If not, split the word into parts and see if you can associate separate parts to a word that you already know. For example, you’re trying to memorize the word “abrogate”, meaning to cancel something. You can separate the word into parts a – bro – gate, making an image in your head about a guy (a bro) standing at the gate of your house, while you’re not letting him in – canceling his right to enter. If you are more of a visual person, what might help you is drawing an actual or mental image that reminds you of that word. Like in the previous example, we’ve separated a word into parts that make sense and we’ve also made up an image about the actual meaning of the word. My advice is to always look, as well as listen to the word carefully. This way, you use two input strategies already, and you’re remembering the word both visually and by sound association. Making as many associations to a word as possible will help you to access the word at a later time from your memory. You will effectively recall it much faster and easier. Another helpful way of memorizing words is by using mnemonics. Mnemonics are memory devices that help you memorize and recall pieces of information. If you were to ask any child if they knew their English alphabet, almost every child who is old enough to speak will start reciting or singing ABCD. This is an example of music mnemonics. The reason people assign music to the information they are trying to memorize is because it is easier to recall later. If you have different words you’re trying to memorize, try singing them in some order. It will be much easier for you to recall them when needed. Or, here is an example of name mnemonics. Have you ever tried to memorize the colors of the rainbow in order? A very popular mnemonics for this is by remembering the name Roy G. Biv – Red, Orange, Yellow, Green, Blue, Indigo, and Violet. To find out more about mnemonics, click here to read about the 9 types of mnemonics for a better memory. There are different ways in which you can make connections to the words you are trying to memorize. Be creative! Find the ways that work best for you and use them throughout your language learning journey. If you don’t use it, you’ll lose it. Unfortunately, there’s no way around it. As we mentioned previously, our brain tries to get rid of information that it thinks it no longer needs, in order to make room for new information. So, if we haven’t used information for a long time (such as those dates from history lessons! ), our brain will erase such information from our memory, finding it no longer relevant. You want to make sure you use what you have learned often. Again, be as creative as you want! Here’s one example that could help you. Let’s say that you’ve just learned a word notorious (being well known for some bad quality or deed). Tourists avoid the area that is notorious for crime. A hurricane is a notorious wind. That club is notorious for the bad choice of music. This way you will not only practice using the new word you’ve learned, but you will also practice sentence structure and expand your vocabulary. You can even come up with your own phrases. Like I mentioned before, be creative and have fun! But remember, keep using the words you’ve learned to be more comfortable with them and to avoid forgetting them. No matter how well you speak a language, using words you’ve learned in an actual conversation will get you out of your comfort zone and rapidly improve your language skills. We call this ‘’learning by speaking’’. You can find and choose an online tutor at a website like italki to practice using the vocabulary that you’ve learned. You can also sign up for our Boo(s)tcamps for a well structured course for beginners. Use what you’ve learned, no matter where you are. 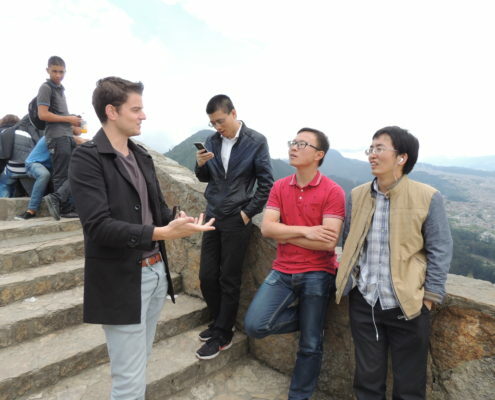 Here I’m practicing my Chinese in Bogota, Colombia. I hope you’ve found this article useful and it helps you to become more confident in your language learning journey. For more tips and tricks on learning a new language, subscribe to our YouTube channel by clicking here.